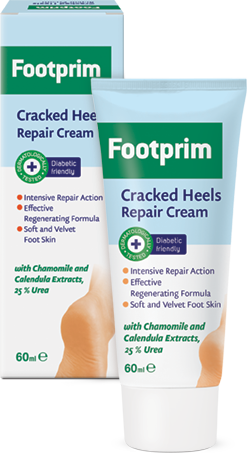 Specially-developed for extremely dry and rough skin – Cracked Heels Repair Cream Footprim intensively restores the affected areas. The effective formula is based on a combination of 25% Urea, Allantoin and Glycerin, which guarantee the swift regeneration and deep hydration of the skin. The natural Chamomile and Calendula Extracts soothe and nourish the skin. The Cracked Heels Repair Cream Footprim works quickly and the results are visible after the first applications. The skin becomes silky soft and smooth. The product is suitable for everyday use. It is easy to spread and does not leave greasy marks. This product is SUITABLE for diabetics and people with impaired blood circulation. Apply the cream twice a day (in the morning and in the evening) on clean and dried skin. Rub in with cyclic, massage movements, until the cream absorbs entirely. Aqua, Urea, PPG-15 Stearyl Ether, Propylene Glycol, Steareth-2, Paraffinum Liquidum, Lanolin, Sodium Lactate, Steareth-21, Glycerin,Dicocoyl Pentaerythrityl Distearyl Citrate, Cetearyl Alcohol, Stearic Acid, Dimethicone, Chamomilla Recutita Extract, Calendulla Officinalis Extract, Allantoin, Lactic Acid, Triacetin, Parfum, Linalool, Geraniol, Limonene, Citronellol, Benzyl Alcohol, Ethylhexylglycerin, Tocopherol, Disodium EDTA.